To reach Chapelco we take Route 40, traveling 18 km through beautiful scenery, with Lake Lacar and the Andes. Chapelco Ski Resort is a ski center invites you to experience winter sports in unique tours, with groomed and hostels ideal for a refreshing break after a long day of skiing. Its forests accompany the layout of the tracks wind protecting and returning to his perfect snow to live fully in the midst of an incredible landscape. Chapelco has a height of 1980 m.a.s.l. and offers more than 22 tracks of different difficulty levels which provides attractive alternatives for every need throughout its more than 140 acres of skiable area. Your offer is not limited to skiers and snowboarders, but also for those who want to have a fun time in contact with the snow and nature will find activities for all ages such as snowshoeing, backcountry skiing, sleigh ride husky dog and snowmobile rides. Taking the cable car ascends to a height of 1600 m.a.s.l. and then two chairlifts, which will allow us to reach the summit at 2000 m.a.s.l. where you can see the Lanin, Villarica, Choshuenco, volcanoes and other peaks of the range, being able to contemplate an incredible view (ski lifts not included). During summer Park Adventure is enabled to enjoy various activities for the whole family such as horseback riding, hiking, mountain biking, archery, mini golf, arena, trampoline, bouncy castle, canopy and harness the fun Andean giant slide. The return is by a winding road in the woods, also noting the establishment of the community Mapuche Curruinca slopes Chapelco lace, and accessing splendid views of San Martin de los Andes and Lacar Lake from the top of the road, mainly from the viewpoint Arrayan. This excursion will allow visitors to see almost all the vegetable species of the Lanín National Park, as they will slowly enter the Valdivian forest, one of the most humid spots in the country. 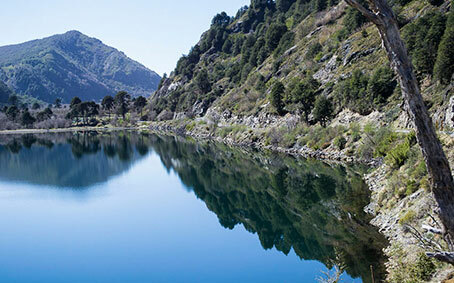 Provincial Route 48 will be travelled passing by Trompul, a high spot from where there is a beautiful sight of Lake Lácar, Chapelco and Mount Abanico. Yuco beach, with its volcanic sandy beaches and its myrtle tree forest, will also be visited. Once in Hua Hum, a spot in the west end of the lake, we go hiking until the spectacular Chachin waterfall. One of the most characteristic visit in the Lanín National Park. It reaches the very base of the Volcano. 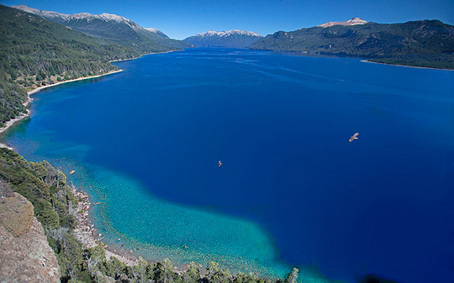 Bordering the Chimehuin River, one of the most famous trout fly-fishing spots in the world, the largest lake in the park -the Huechulafquen- is reached and its entire length, with its blue waters and its impressive waves, is visited. Before that we visit Junín de los Andes, its centre, the church and the Mapuche cultural centre, where they offer traditional handicraft. This is our first contact with tha mapuche culture. At midday, we stop in a mapuche community to have lunch. After that the excursion will reach Puerto Canoa, a beautiful spot located on the shores of the lake. 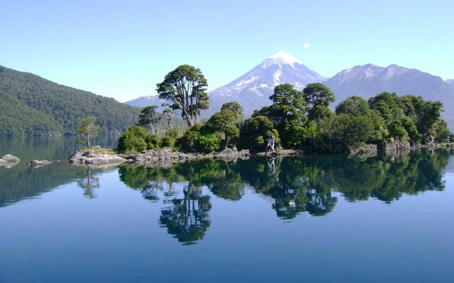 There is also the opportunity of going on a lake excursion across Lake Epulafquen in order to observe the marvelous lava at the Escorial of 6 km lenght. After lunch, the excursion will reach Lake Paimun, with its green waters suitable for swimming, as they are not so cold. In different places of our trip we can see an impressive view of the Lanín Volcano, almost 3,800 m of height, and its snow-capped summit. Departure from San Martin de los Andes, in the early morning along National Route 40, passing through the town of Junin de los Andes, then take Provincial Route 60 where bordering the Malleo River and the frame area Patagonian steppe begin to enter a great forest of puzzle trees, which is shared between Villarrica and Lanin National Park in Chile. Arrive at the border crossing or Mamuil Tromen Malal, where we will see the imposing Volcan Lanin (north face), after making the immigration process in both border posts, we will go along the Trancura River between Valdivian jungle populated Curarrehue, then move 15 km. 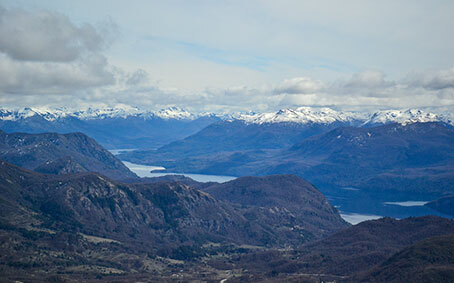 and reach the town of Pucon. 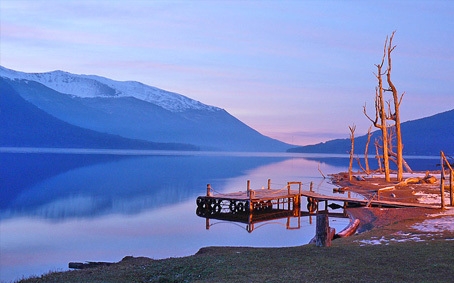 Pucon is a resort of international level, located on the shores of Lake Villarrica and near the foot of the Villarrica volcano with its constant plume. You can enjoy warm waters and beautiful beaches, the scenic city of crafts, with typical wooden flower stalls, their typical seafood meals, visiting every corner of one of the most pleasant and picturesque towns of Chile. After a few free hours in Pucon, we begin to return by the same route to get back to the city of San Martín de los Andes and can watch the sunset. Departure early in the morning by the 234 National Road travelling 115 km. of lush forest, rivers of clear water and the lakes: Machónico, Falkner, Villarino, Escondido, Correntoso, Espejo and Nahuel Huapi. At midday we arrive at Villa la Angostura and we visit this beatifull touristic village, its bays, Messidor Residence and its wonderful gardens. Then we have free time to have lunch in the centre area. In the afternoon we visit Puerto Manzano and its majestic architecture. Finally we start returning by the same way, the Seven Lakes Road, to arrive to our city. Summer village located 17 km from San Martín de los Andes, on the southern shore of Lake Lácar. This volcanic sand beach with particular characteristics for the practice of nautical sports such as waterskiing, windsurfing, fishing, kayaking or launch navigation is reached along a beautiful mountain road, with forests of roble pellín, radal, ñire and flowers such as rosa mosqueta, amancay, mutisia, topa topa, etc. During the tour, houses belonging to the Mapuche Curruhuinca community, with their fences, their animals and their school may be seen and visitors may purchase authentic Indian crafts. Before going back, visitors have free time and they can go for a walk across the forest to see the rapids of the Grande Creek, an ideal site to make a halt and see the impressiveness of thaw and the huge coihues that give frame to the landscape. Or just visit the three different beaches along the shore and relax. Leaving in the early morning along National Route 234, travelling 115 km across exuberant forests, crystal-clear rivers and passing by Lakes Machonico, Falkner, Villarino, Escondido, Correntoso, Espejo and Nahuel Huapi. 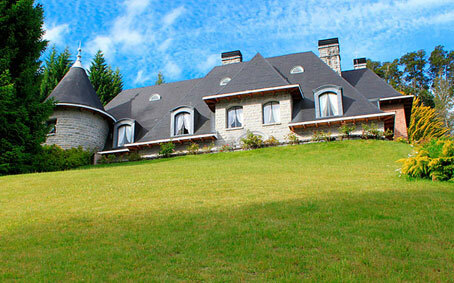 At midday, the excursion gets to Villa la Angostura. This beautiful tourist village, its harbors, the El Messidor Residence and its gardens will be visited. After having lunch, the shuttle will return along the same 7-Lake Road, passing once again by Lakes Espejo and Correntoso, and it will take the junction leading to Villa Traful. The road presents an attractive ascent through the thick forest in search for the Portezuelo Pass. As excursionists descend, they will make contact with the southern coast of Lake Traful, which they will see completely. Next to the lake, through a coihue forest, we arrived in this small mountain village where a little more than 300 people live. Staying at Villa Traful will enable visitors to go around the entire village. As they leave this place behind, they will approach the heights of the Viento Vantage Point, an impressive cliff raising 70 m over the surface of the lake. The excursion will return along the same Seven Lakes Road. 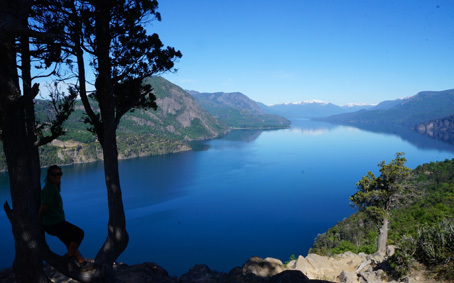 Departing Villa la Angostura and heading for the north starts one of the most beautiful and charming routes of the area, the Ruta de los Siete Lagos -"Seven Lakes Road"-, also the way to San Martín de los Andes, a small quiet mountain village situated on the Lácar lake. Visitors can enjoy excursions to the lakes, to Quila Quina beach and the Hua Hum area as well as the ski slopes of Cerro Chapelco. 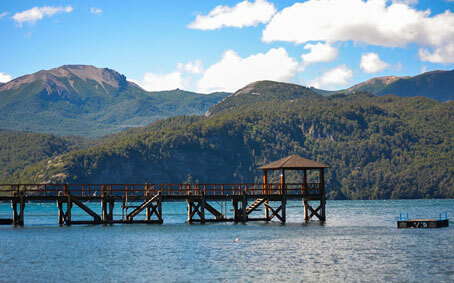 You only have to enjoy and watch the nature of the area, one of the most picturesque of the Argentine Patagonia.